The Superman Fan Podcast: Episode #373 Part II: Superman Family Comic Book Cover Dated September 1964: Superman's Pal Jimmy Olsen #79! Episode #373 Part II: Superman Family Comic Book Cover Dated September 1964: Superman's Pal Jimmy Olsen #79! Superman's Pal Jimmy Olsen 79, September 1964! Download Episode 373 Part II! SUPERMAN'S PAL JIMMY OLSEN 79, September 1964, was published on July 9, 1964. It contained 32 pages for the cover price of 12¢. Mort Weisinger was the editor, and the cover was pencilled by Curt Swan, inked by George Klein and lettered by Ira Schnapp. It featured the issue's third and final story. - (14:44) JIMMY OLSEN'S FORGOTTEN GIRLFRIEND (8 pgs. ), written by Leo Dorfman, pencilled by Curt Swan and inked by George Klein. - (34:56) THE MENACE OF INSECT ISLAND (8 pgs. ), written by Leo Dorfman and drawn by George Papp. - (48:47) JIMMY OLSEN'S PEN PALS letter column. 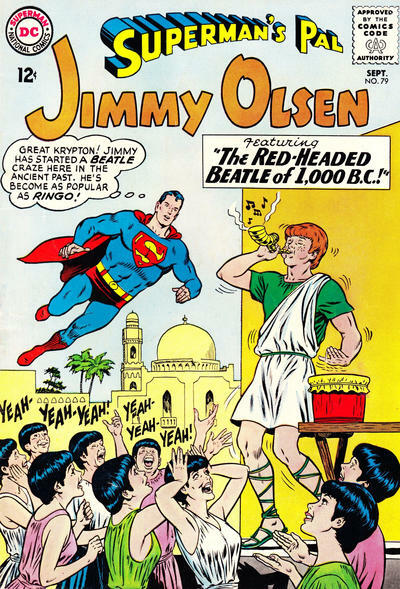 - (57:14) THE RED-HEADED BEATLE OF 1,000 B. C. (9 pgs. ), written by Leo Dorfman and drawn by George Papp. This story was also reprinted in SUPERMAN IN THE SIXTIES. Also highlighted in this episode are the issue's ads and other features, including the short article, JIMMY OLSEN'S TIME TRIPS. We will finish looking at the Superman Family of DC Comics cover dated September 1964 with: PART III: 80 PAGE GIANT 3 (starring Lois Lane and co-starring Lana Lang), PART IV: WORLD'S FINEST COMICS 144 & PART IV: ACTION COMICS 316! Then we will feature: SUPERMAN COMIC BOOKS COVER DATED OCTOBER 1964: PART i: SUPERMAN 172, PART II: SUPERMAN'S GIRL FRIEND LOIS LANE 52, PART III: ACTION COMICS 317 & PART IV: SUPERMAN'S PAL JIMMY OLSEN 80!